"This is a tasty and complete meal. My family is wild over this recipe and I'm always asked to bring it to pot luck parties." In a skillet over medium heat, brown the ground beef until no pink shows; drain excess fat. 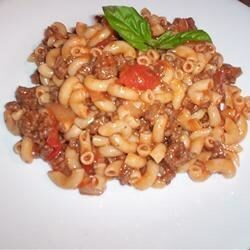 In the large pot, combine macaroni, beef, tomato soup, tomato juice and corn; heat through. Stir in cheese. We did not like this at all. Probably one of the worst recipes I have ever tried. Will not make again. This recipe was a little bland so I added garlic, basil, italian seasoning and it was very tasty. Pretty good base recipe just needs some extra spices to jazz it up and more cheese. Kids loved it and so did I. Spiced it up a little bit but stuck to the basic recipe. Wonderful for those hectic week night dinners! Great base recipe. I added chilli, garlic, and itialian seasoning and used tomatoe sauce because I was out of tomatoe soup. I think I will play with the seasonings more next time but very good. This was very tasty! I used a meatloaf seasoned tomato sauce and added green beans with the corn. It was delish, and reheated well.